Superhero TV, movie and book fans rushed to the 2018 San Diego Comic Con. It's an overcrowded madhouse... one that I enjoy attending annually. Because of the sheer volume of people (many in superhero costumes), you don't get to do or see everything you want. So my battle plan is always to pick my #1 priority and try all day to accomplish that goal. That's a superhero job in ins own. On Saturday, I wanted to see the superhero CW Panels: Supergirl, Arrow, the Flash and the Legends of Tomorrow. Yay for superheroes and their TV shows. After waiting over 4 hours in line, I got to see 3 out of the 4 superhero panels. Which were all worth the wait. The San Diego Comic Con is the perfect venue to promote TV shows with comic book characters... be they superheroes or not. The audience treats the cast and crew like rock stars / superheroes. Here are some of the highlights. Stephen Amell discussed the changes to his TV character that might not make superhero fans happy. But it's fun for him to do something different after 7 years of playing the Arrow in a specific way. He's keeping TV superheroes fresh. The cast of the super popular superhero TV series the Flash talked about how they put their spin on playing a speedster. But everyone complimented the original TV show superhero Flash, Grant Gustin, on his ability to stop the speedster for the camera. With some prompts from the crowd and tossing off his shoes, he showed everyone how it’s done. The big change for this TV show season of the Flash is that Iris and Barry’s daughter from the future joins the cast. Grant Gustin and Candice Patton talked about how this affects their characters while being adorable. I have to binge watch the superhero TV show Legends of Tomorrow to get caught up on the episodes because I had no idea they introduced a larger-than-life character called Beebo. Fans love this big blue creature as much as they love a character named Gary. 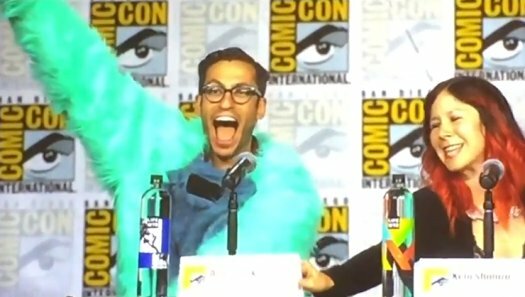 So when the actor who plays Gary, Adam Tsekhman, attended the panel as Beebo, the audience went wild with cheers and chants. Zeroes by Scott Westerfeld et al: I love this superhero series so much that I will randomly recommend it to my friends, even when not prompted. Just so I can talk about the characters who have awful super powers that always gets them in trouble. Wonder Woman by Leigh Bardugo: After the huge success with her Six of Crows series, this author discussed the joy of being able to write a story in the Wonder Woman universe at last year’s San Diego Comic Con and I waited for hours to receive an advanced readers copy. Percy Jackson and the Olympians by Rick Riordan: Percy’s powers are godly but they definitely come in handy when his group of friends save the world. These are middle grade / teen superheroes. Jessie is one of our best romance book bloggers. She is also an aspiring romance / young adult author. She lives in Oregon and writes / blogs to avoid the rain. She only feels compelled to kill her characters when she starts a new diet. If she hates the ending of a TV episode she’ll rewrite it to give everyone a happily ever after. Currently Jessie is an unpublished author, but she works tirelessly to removed two letters – un – from that word. For now she's blogging and writing as fast as she can. She also writes the Apples to Oranges monthly blog about novels that have made into movies or TV shows.